Assassin’s Creed Chronicles: China – the first in a planned downloadable trilogy – is the best spin-off the franchise has received so far, rising high above the mostly garbage mobile and handheld titles. The 2.5D stealth title blends signature Assassin’s Creed elements and plenty of influence from 2012’s Mark of the Ninja. I’m glad somebody’s borrowing from Klei Entertainment’s brand of platforming, sneaking, and killing, as it fits well with Ubisoft’s world. The protagonist, Shao Jun, returns from her appearance in Assassin’s Creed Embers, where she trained with an older Ezio Auditore. A Templar gang called the Tigers previously drove out and killed most of the Assassins in China, and she’s back for revenge. Shao Jun proves to be an agile platformer, running, crouching, climbing, and jumping throughout 12 memory sequences (there are no current-day components). Most of the gameplay consists of entering a large area patrolled by increasing amounts and varieties of guards. Their vision cones pan back and forth. You scan with blue eagle vision to see farther ahead and track their routes. Then it’s a matter of darting between hiding spots, tossing out a noise dart for distraction, stunning guards with firecrackers, snapping a neck here, stabbing a back there, and hiding the bodies. Most everything controls tightly except for that last bit; I always had to hit the pickup body button several times to get it to work. You can’t mash it until it works, because Shao Jun will lift and drop the body. When the windows for killing and hiding without getting caught are this tight, it’s frustrating to be undone by something that should just work. That said, I enjoyed thinking my way through encounters. Strategizing a creative route, killing that one annoying guard that seems to be looking everywhere, and then earning a perfect gold rating when you hit that next checkpoint feels great. These ratings are tallied up at the end (alongside side-mission bonuses like rescuing slaves), and certain score thresholds grant upgrades like new abilities and more health. The in-game maps of these relatively large stages are always fully visible, but several require syncing from a high point to see the pickups scattered about. The layout is a bland gray with black and white icons, making them hard to see. The maps lack detail in general, showing useless building exteriors during interior sequences, and I constantly wished I could zoom out more than the claustrophobic view allowed. A handful of fast-paced escape sequences are tossed in to break up the core stealth gameplay. Fire roars from behind as you sprint and hop around all manner of obstacles and quick-kill guards standing still with their backs to you. While I appreciated the change of pace and opportunity to go full throttle, nothing really sets it apart from a standard runner game experience. A little over halfway through the campaign, the gameplay starts to lose steam. Patrols get more elaborate, but you’re stuck using all the same old tools. While the game introduces several new enemy types, almost all of them behave the same on patrols (and all die from a well-timed Assassin stab). You can’t experience how much stronger and faster they are unless you get caught, which is never supposed to happen anyway. This isn’t helped by the underwhelming story about assassinating one villainous Templar after another. The end doesn’t spice things up, and it also leaves a thread open to remind you that there are two more of these games left. I just hope they’ve got enough differentiating features to keep players invested. This review is in reference to the Xbox One version of the game. 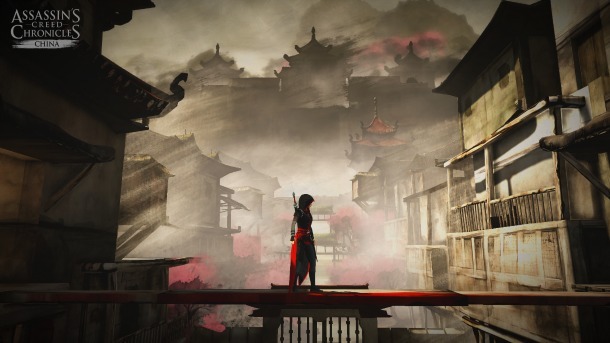 Assassin’s Creed Chronicles: China is also available on PlayStation 4 and PC.